Stephen Frears’ Hero was a sizable flop back in 1992—maybe because while it vaguely promises a throwback to screwball comedy, what it actually delivers is a modern reworking of a softer, less snappy Frank Capra dramedy. (It’s also possible that audiences as a whole don’t seem to care much for retro genre pastiches.) The story developed by producer Laura Ziskin, veteran screenwriter Alvin Sargent, and often-brilliant screenwriter David Webb Peoples (Blade Runner, Unforgiven) takes several cues from Capra’s Meet John Doe, in which a gentle tramp (Gary Cooper) is hired to take credit for a series of newspaper articles encouraging Americans to help each other out. 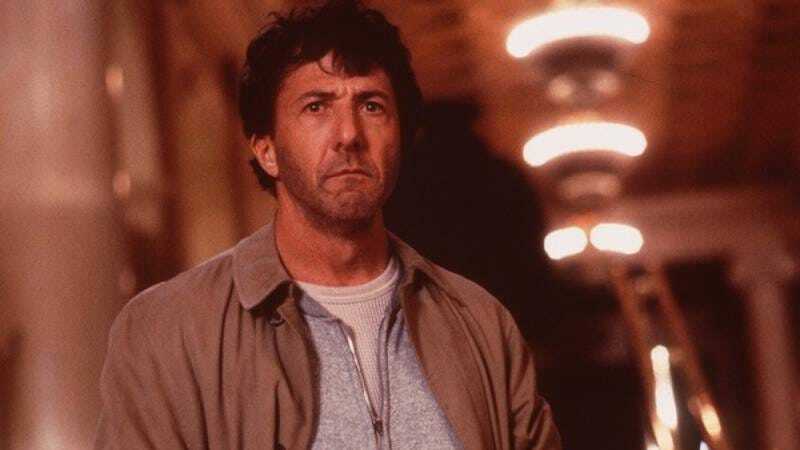 To the story of a good man telling a lie Hero adds Bernie LaPlante (Dustin Hoffman), a muttering part-time criminal who boosts credit cards and advises his 10-year-old son to “keep a low profile.” Bernie could never be mistaken for a Gary Cooper type. But when a plane crashes right in front of him, he reluctantly charges into the fiery wreck and carries out several passengers, including reporter Gale Gayley (Geena Davis)—and her purse, which he quietly snatches. Thinking he’s let down a kid who asked him to help out his trapped father, Bernie disappears into the night, unaware for many hours that he has become the “angel of Flight 104” in the news. When Gale’s news director (Chevy Chase, crackling in the kind of movie he should have pursued more often) authorizes a hefty reward, a gentle hobo named John Bubber (Andy Garcia) steps forward to claim it. Meanwhile, no one believes that Bernie performed this act of heroism; they barely let him get a word in edgewise as he sputters, swears, and lusts for the reward money that’s rightfully his. This homage also ends with a snap worthy of Capra or Preston Sturges. But while the movie lightly satirizes the media frenzy around camera-ready John Bubber, Hero doesn’t indict the American mythology of humility and heroism from its more modern perspective; in its cockeyed way, it celebrates both Bubber’s idealism (though he’s lying about the plane rescue, he wants to help people) and LaPlante’s unexpected ability to rise to the occasion, holding firm in its belief that even a lousy guy can do something heroic. LaPlante and Bubber are both heroes and both frauds. Frears and Peoples make that notion feel downright democratic. Availability: Hero is available on DVD from Amazon or possibly your local video store/library, as well as for rental or purchase through the major digital platforms.